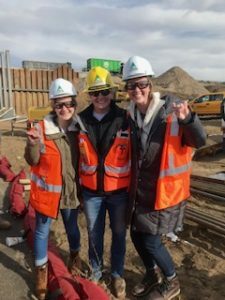 Louisiana Tech University seniors Chloe Wallace and Katya Opel recently attended the 2019 Kiewit Women in Construction Leadership Seminar in Colorado. Katya Opel (left) and Chloe Wallace (right) with Louisiana Tech graduate and Kiewit employee Mallory Walters. The Women’s Construction Leadership Seminar is a two-day event designed to develop the leadership skills of collegiate women. Attendees for the limited-seat seminar are selected based on academic success, leadership potential and passion for construction and engineering fields. While at the seminar, Opel, a civil engineering major, and Wallace, a construction engineering technology major, got hands-on experience, as well as networking experience, and were able to tour active construction sites and gain valuable knowledge of the industry. Both students were recommended by Jeff Pike, senior lecturer of civil engineering and construction engineering technology.